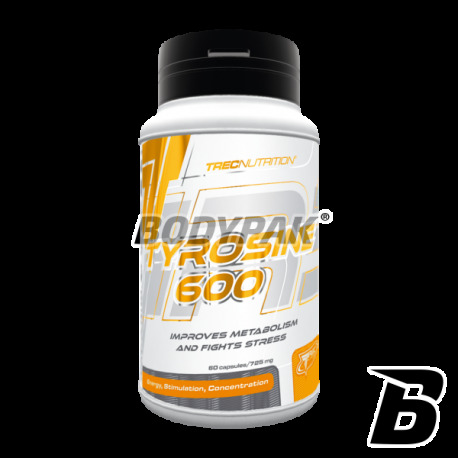 Health & BeautyTrec Tyrosine 600 - 60 kaps. Tyrosine 600 a beneficial effect on memory and concentration, and improves the process of burning fat. Tyrosine 600 enhances motivation, endurance and resistance to stress of intense training athletes. Furthermore, the product accelerates the metabolism, while increasing the energy production from adipose tissue. One serving (1 capsule) 2-3 times a day, 30 minutes before the first meal and before training. One serving (1 capsule) 2-3 times a day, 30 minutes before a meal. Ingredients: L-tyrosine, magnesium stearate - anti-caking agent, gelatin (A) / (B) cellulose - capsule shell. See the number and series production. Nie wierzyłem w to, że tyrozyna wspomaga spalanie tkanki tłuszczowej. Kupiłem żeby sprawdzić. Nie myliłem sie - brak efektów..